Discussion in 'New Game Discussion' started by DeluxFTW, Mar 25, 2019. 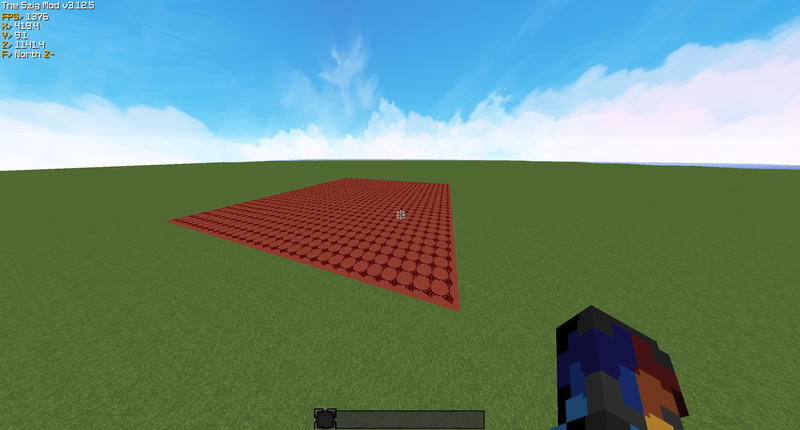 I have came up with a game called Redstone Wars where you are in an arena of red hardened clay covered with redstone dust and surrounded by barriers. The picture below is an example of what it will look like. Although, I'm not sure how big the arena should be. There are 2 teams. One team needs to break away the redstone while the other team needs to put it back. No pvp is involved in this game. When the game starts, the team that needs to put back the redstone dust will always have it in their inventory slot 1. There will be a scoreboard on the right indicating how many blocks in the arena have redstone dust, or are empty spaces. You have 2 minutes to fight for the redstone. One block without redstone dust is a point to the team who is responsible for breaking away the redstone. The block with the redstone dust is awarded each point to the team who is responsible for putting the redstone back. Once the time is up, the team with the most redstone dust, or most empty spaces wins. Very interesting idea! The max would be 24 players, so the map would need to be able to fit them all easily. What would the two teams be called? One of the teams will be called “Steelers”, which came from the steel metal and will break away the as if they were “steeling” the redstone. I’m not sure what the name of the other team will be. I like the concept of the new game idea that you have, but you need to elaborate more about how does the gameplay work in general. About the maximum of 24 players in Redstone wars what @Hqzardous has mentioned above, I do not think it is necessary because this may result in some of the players who will be forced to be a spectator during the game. How long does the game will last in Nano? Should the game last like 2-3 minutes? I believe that the game needs to have at least 3 minutes before the game is over. This seems like a really cool idea, I think it'd be an interesting and fun addition to Nano Games!